Have you ever thought… what if your gym, fitness, sauna or indoor pool is moldy? Think about it. These areas are in use all day long, and the windows steamed up with sweaty air – all of them provide enough humidity for indoor mold to begin growing and producing mold toxins. Based on a published study in 2016 (1), breathing at exercise intensity is about three times faster than while resting and exercise-induced inhalable particle concentration is about two times larger than outdoors. So at the gym, you can get about a sixfold higher dose of particles, mold, toxins, gases or VOCs. Volatile Organic Compounds (VOCs) are carbon-based organic chemicals such as formaldehyde, benzene, styrene, chloride, xylene and toluene that are found in the buildings. They are mostly odorless and can easily evaporate “off gas” and get into the air at room temperature. VOCs are found in building materials, indoor furnishings and cleaning supplies. Health risks associated with high levels of VOCs can be nose, eye and throat irritation, headaches, nausea and dizziness. If you exposed over a long period of time, VOCs can damage the kidney, liver and nervous system and may cause cancer. Since the inhalation rates increase while exercising, thus the exposure levels increase at gyms and fitness centers. 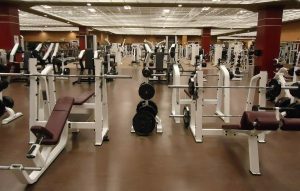 In addition, Gyms are well known for having poor ventilation systems that fail to properly circulate fresh air. Also cleaning products that can contain VOCs are used more often for cleaning in the fitness centers. So fitness clubs should consider air testing for VOCs levels in their facilities. Call Healthy Indoor Professionals at 310-971-6723 to perform an air quality test in your gym, fitness center, sauna or indoor pool.